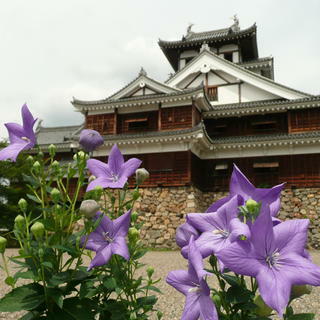 Balloon flowers are part of the family crest of Akechi Mitsuhide, the first lord of Fukuchiyama Castle and are also the city's official flower. Take Kyoto Kotsu Bus from JR Fukuchiyama Station to the "Fukuchiyamajo Koen" bus stop, then walk 2 minutes. 25 weeping cherry trees bloom in mid-April along the approach to the Kyoto Tree-planting Center, and are illuminated to give the illusion of a flowing waterfall. Take train to Kami-Yakuno Station on the JR San-in Line, then walk 20 minutes. This Japanese wisteria, entwined around a 2,000 year old zelkova serrata Japanese elm, grows in every direction, and is a Kyoto Prefecture Designated Natural Monument. 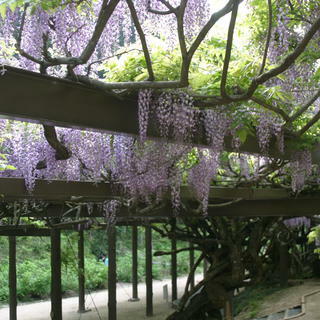 The wisteria is in full bloom around mid-May 5 when it draws large numbers of visitors. Take train to Oe Station on the Kyoto Tango Railway, then take City Bus Nika South line to "Minami Ariji", then walk for 20 minutes. 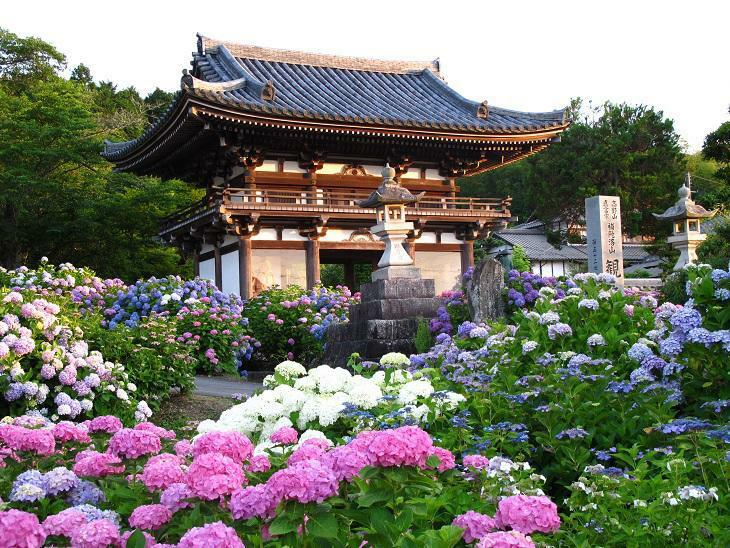 The Kanonji Temple is said to have been built in the year 720, and is covered by over 10,000 hydrangeas during the rainy season. It is also considered the "No. 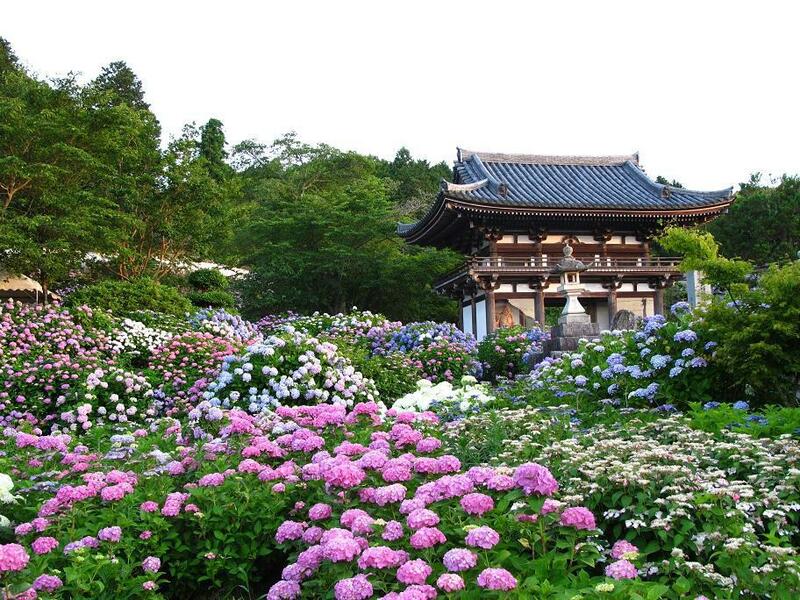 1 sacred place for temple flowers in Kansai" and is famously known as "Ajisai Dera" (the hydrangea temple). Take train to Isa Station on the JR San-in Line, then walk 15 minutes. Take Kyoto Kotsu Bus Fukuchiyama Line from JR Ayabe Station to the "Kannonji" stop, then walk 5 minutes. 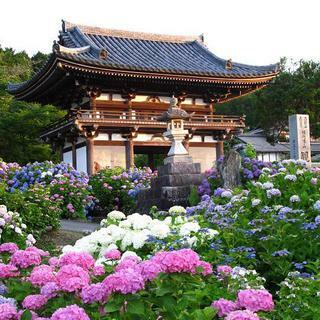 This temple was built on the site of the ruins of Isa Castle which was constructed sometime during the Azuchi–Momoyama Period. 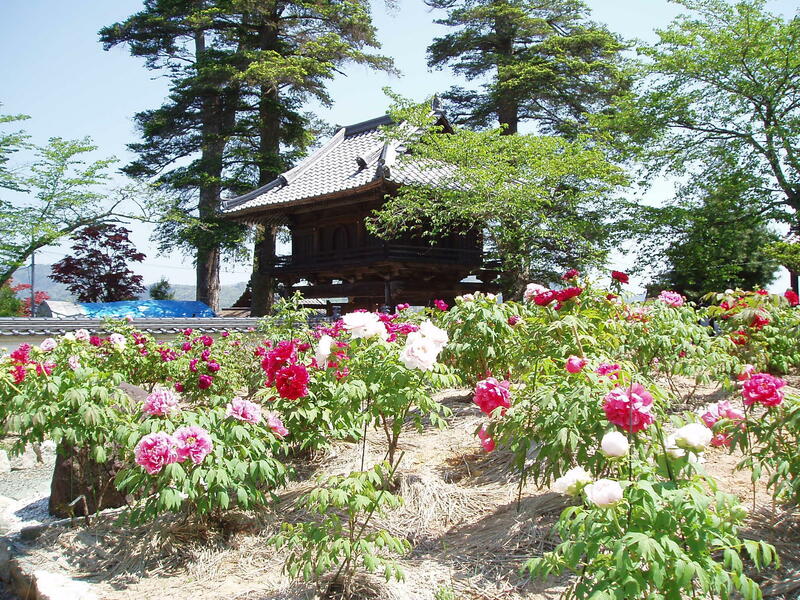 30 different types of over 250 colorful peonies bloom here around May every year, and the temple is also known by the nickname "Botan-ji" (peony temple). Take train to Isa Station on the JR San-in Line, then walk 10 minutes. Take Kyoto Kotsu Bus Fukuchiyama Line from JR Ayabe Station to the "Isa" stop, then walk 3 minutes. This temple is famous as the temple where Minamotono Yoritomo prayed for victory over the oni in one of the Mount Oe oni legends. 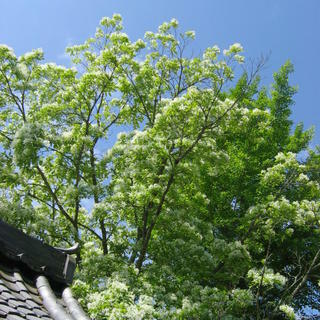 Many people visit the temple in May to see the Chinese fringetree in full bloom with hundreds of little white flowers. Take Kyoto Kotsu Bus Kawakita Line from JR Fukuchiyama Station to the "Kawakita" stop, then walk 1 minute. 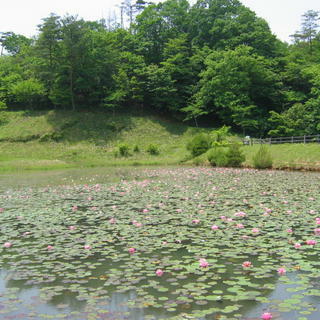 Pink, white, yellow, and various other colored water lilies decorate the surface of the Hatada pond in Nozasa, and the pond is famously known as the "suiren ike" (water lily pond). 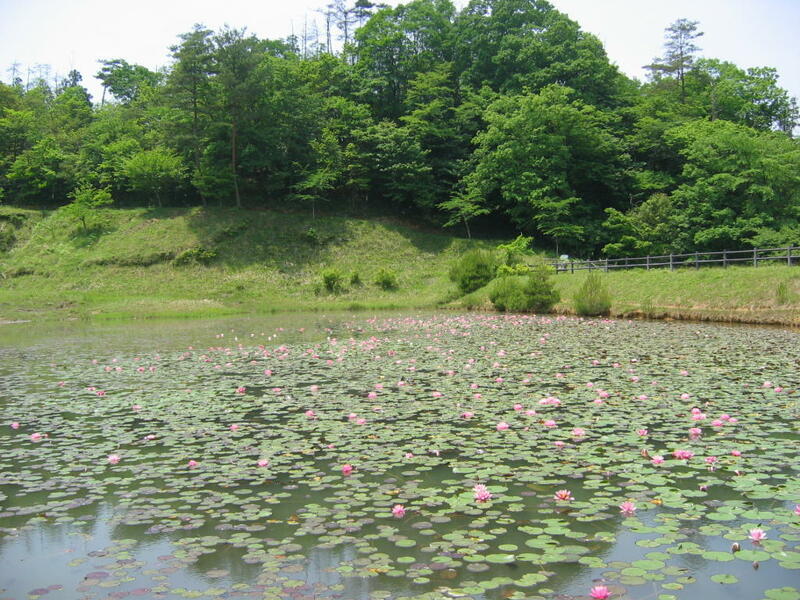 The site has been selected as one of Kyoto's Best 100 Reservoir Ponds and attracts large numbers of visitors from June to September. Take train to Shimo-Yakuno Station on the JR San-in Line, then walk 50 minutes. 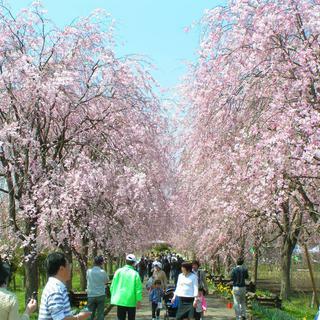 Take the Kyoto Kotsu Bus Yakuno Line from JR Fukuchiyama Station to the "Oyama" stop, then walk 20 minutes. 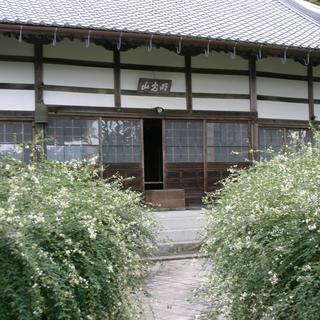 This Nanzen-ji branch Rinzai Sect Zen Buddhist temple was established in 1339. 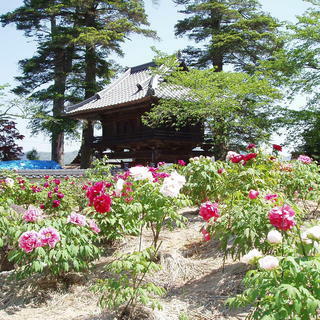 The entire temple grounds are covered in Japanese bush clover and it is affectionately known as the "Tanba hagi tera" (Tanba Japanese bush clover temple). 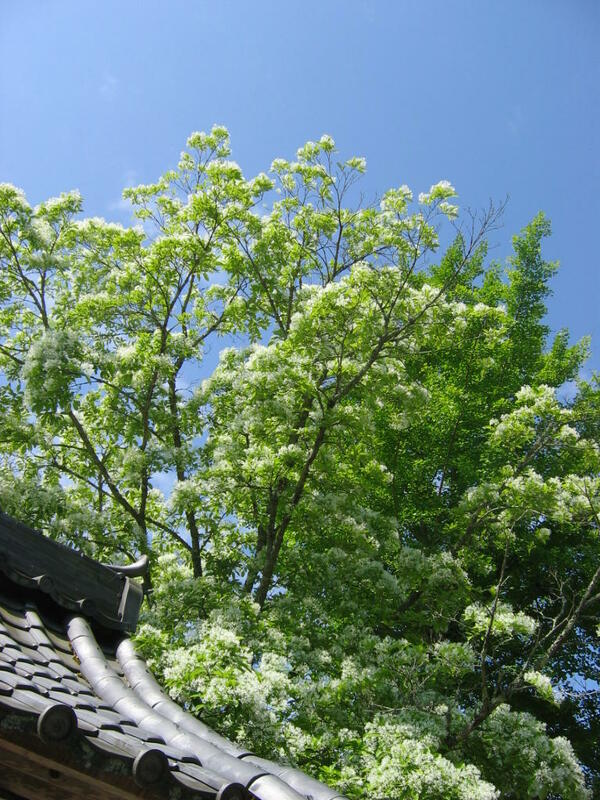 Take Anga Bus from JR Fukuchiyama Station to the "Nakamura Danchi Mae" stop, then walk 5 minutes. This temple is the no. 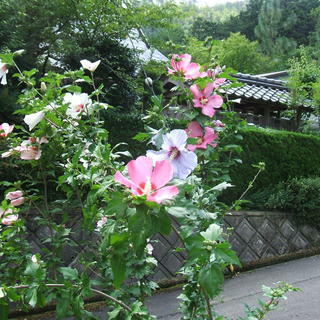 6 amulet-issuing office on the Amadagun Kannon circuit, and is famous for the white, purple, red, and other colors of hibiscus which decorate the temple approach. Take the JR Bus Enbuku Line from JR Fukuchiyama Station to the "Senzoku" bus stop, then take the City Bus Hagi Go Ubara Line to the "Obata" stop and walk 20 minutes.